Many top sportsmen and sports clubs employ nutritionists in order to ensure that not only are the right foods being eaten but that they are being consumed at the right time of the day for example just before or after a competition event to maximise their effect. Runners competing at the top level are no different. But for those of more humble ability, you might think that diet should not be a major factor. Wrong! It is true that when enthusiastic amateurs put on their training shoes there are no medals or titles at stake, but the rewards for their efforts are much more important than a piece of a ribbon and a metal disc, namely mental and physical well-being. And while they are unconcerned whether eating bananas at certain times of the day will shave hundredths of a second off their time, it is nevertheless important that a sensible and well balanced diet is followed that will not only give them the ability to run with power and confidence but also provide their body with the right levels of vitamins and minerals to work efficiently during exercise and recover well afterwards. For those who have taken up running in order primarily to lose weight, one of the dangers is that an increase in physical activity will be combined with a reduction in calorie intake, in the hope that the weight “comes off” both quicker and easier. This is simply not a good idea. Yes, weight gain is a consequence of a lack of exercise and eating too much but tackling it by rapidly increasing the former and decreasing the latter is unhealthy. To run, your body needs food that it can easily convert into the energy required to propel it forward. So rather than reducing the amount of food, the aim should be to cut out individual foods of questionable nutritional value and begin eating those that will make you, in effect, a leaner, meaner running machine. Let's start with carbohydrates, in effect the source of fuel that your body runs on. These are commonly sourced from pasta, rice, potatoes, bread and pulses. 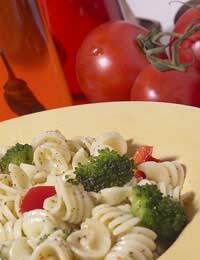 Pasta, in particular, has often been portrayed as the runner's food of choice because it is relatively easy to prepare and can be combined with a simple sauce that will bring additional nutritional benefits, for example tomatoes, broccoli or spinach. Fish and lean red and white meat can also be incorporated. Sauces or accompaniments to pasta can work equally well with boiled potatoes, rice or beans, offering the opportunity to introduce more variety into your diet. This is important because boring your taste buds can lead to the temptation to turn to less nutritious snacks. Fruit should also play an important part in diet. The UK government's campaign to promote five portions a day is evidence of the benefits to be gained not just in terms of vitamins but also fibre. Not only that, apples, bananas, oranges and pears are very practical in terms of popping into a jacket pocket or handbag and can be enjoyed throughout the day. In terms of an eating routine, it is better to eat smaller portions more often than larger ones the traditional three times a day, and remember to drink water regularly. Even if work schedule or child care duties make breakfast a difficult time to sit down and eat, don't go hungry. At the very least, eat some fruit on the move. And try to avoid eating at too late an hour in the evening as it is not ideal in terms of digestion and can be detrimental to enjoying a good night's sleep. Rather than the endless salads of popular myth, choosing to eat a healthier diet can actually mean introducing more exciting dishes into your daily menu. Invest in some new cook books and find novel ways to excite your palate. The thought of the interesting dish awaiting your return will provide you with added incentive to perform to the maximum.